Chronic wasting disease, or CWD, is a neurological disease infecting wild white-tailed deer in Iowa and other members of the Cervidae family in North America including mule deer, elk, moose, and caribou. This page provides information on the current status of the disease in Iowa, references to learn more about the disease, and some simple recommendations everyone can follow to reduce the spread of the disease and ensure safe consumption of venison harvested in Iowa. Don’t feed deer. Concentration of deer around artificial food or mineral sources can increase risk of transmission of the disease. In harvested deer, minimize contact with portions of the deer with the highest possible CWD concentrations (brain, lymph nodes, spinal cord, spleen) and safely dispose of all processed carcasses where other deer will not contact them such as in a landfill or deep in the ground. Cooperate with the Iowa DNR on routine CWD surveillance sampling of harvested deer if asked. If you are hunting in or near an area with known CWD cases in wild deer, consider following CDC recommendations and having the deer tested prior to consumption. Some tests are available in cooperation with routine surveillance being conducted by the DNR or you can submit your own samples through a diagnostic lab. This website from the Minnesota DNR has an example of taking the necessary sample, which can then be submitted to the University of Minnesota Veterinary Diagnostic Laboratory for testing. Conduct initial processing of the deer while results are pending and then discard meat from CWD-positive deer or complete processing of CWD-negative deer. Follow state laws regarding transportation and importation of deer, elk, moose, and caribou after hunting in areas with CWD. Captive facility operators should ensure wild deer have no interactions with captive herds. Report any deer that appears to be sick to county conservation officers. Download an article from Iowa State University Extension and Outreach that explains the science behind Chronic Wasting Disease and discusses how you can help reduce the impacts of the disease in Iowa. Learn about Chronic Wasting Disease in from Iowa State University wildlife disease ecologist Dr. Julie Blanchong in this short video. This map shows the current distribution of CWD in wild white-tailed deer in Iowa based on surveillance sampling by the Iowa Department of Natural Resources on hunter-harvested deer throughout the state since 2002. This map from the U.S. Geological Survey shows the current distribution of CWD in wild and captive deer, elk, moose, and caribou in North America. CWD is in the class of neurological diseases called transmissible spongiform encephalopathies (TSE), that infects hoofed mammals in the Cervidae family (cervids), including white-tailed deer, mule deer, elk, moose, and caribou. CWD is similar to other more well-known TSE diseases like bovine spongiform encephalopathy (mad cow disease) of cattle, scrapie of sheep and goats, and Creutzfeldt-Jakob Disease of humans. All these diseases are caused by an abnormally shaped class of proteins called prions, which cause microscopic holes to form in the brain, giving it a spongy appearance, and ultimately degrade neurological functions and cause death. All known TSE diseases are fatal, although some, including CWD, have delays between initial infection and display of symptoms and death. CWD generally has prolonged incubation period, ranging from 16 months to 3 years, before the infected animal shows any symptoms. Once symptoms are expressed, they are consistent with those seen in many more common ailments of deer and are thus not individually diagnostic of CWD infection. A symptomatic CWD-positive deer will simply appear sick, with common symptoms including drooling, poor balance, or emaciation. However, healthy-appearing deer could also be infected with the disease and not be symptomatic. Only laboratory tests conducted by disease specialists can confirm CWD infection. Most laboratory tests are performed with samples of tissue from the brain or lymph nodes of a dead deer. All known cases of CWD in wild deer have resulted in death of the afflicted animal shortly after symptoms become apparent. There is mixed evidence among white-tailed deer and other species (mule deer and elk) affected by CWD that infection can increased vulnerability to harvest or predation before succumbing to death by the disease. There is also some evidence to suggest that successful reproduction is reduced in infected deer. Research on genetic aspects of the disease has revealed that although there is genetic variation in susceptibility of some animals, there are no known genes that completely prevent infection, suggesting all animals are potentially vulnerable to contracting the disease. 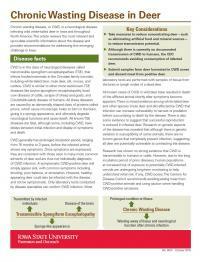 Research has shown no strong evidence that CWD is transmissible to humans or cattle. However, due to the long incubation period of prion diseases, human populations at increased risk of exposure to potentially CWD-infected cervids are undergoing long-term monitoring to help understand what risk, if any, CWD poses. The Centers for Disease Control recommends avoiding eating meat from CWD-positive animals and using caution when handling CWD-positive carcasses. CWD can be transmitted from an infected deer to a healthy one through incidental exchange of bodily fluids, such as nasal discharge, saliva, urine, feces, or birthing matter. Likely routes of transmission include behaviors that bring deer into direct contact such as artificial feeding, interactions between bucks, or social interactions among family groups. Because CWD prions, the disease-causing agent, can persist in the soil, areas where bodily fluids of deer, such as saliva, urine, feces, or birthing matter, accumulate could serve as sources of infection. Such locations include concentrated feeding areas, scrapes, or other areas where deer gather.